One of the best ways you can support TouchArcade is by doing your Amazon shopping through a TouchArcade affiliate link. We’ve set up the easy to remember toucharcade.com/amazon too if you want to type that in or bookmark it. We get a small percentage of anything you buy through any of these links, which otherwise would just go to financing Jeff Bezos’s flying Miata or whatever else he’s up to now, and it goes a long way to supporting the site at no additional cost to you. These Amazon Items of the Day articles are all products we have used ourselves, and feel are things that the TouchArcade audience might be interested in! I’ve been a corded headphone guy basically forever. Over the years I’ve tried a few different wireless gaming headsets and eventually ended up just returning them all because either the sound quality was bad, the battery life was bad, the range was bad, or a combination of the three. After having a few friends pick up a pair of the SteelSeries Arctic Pros and consistently tell me how great they are, I took the plunge and skeptically ordered a pair myself. I’ve been using these things daily for a while now, and I’m never going back to wired headphones. I primarily use my set of SteelSeries Arctic Pros hooked up to my PC both for gaming and just general day to day tasks. On a single charge, they’ll last an entire day of working, and then a whole night of gaming- All while using Discord or whatever else without issue. You really never need to worry about the charge level of the battery either, as the wireless transmitter that it comes with also serves as a battery charging dock. It comes with two batteries, so whenever you’re running low you just slide the one out of the charger, swap the battery from the right side of the headphones, and put the low battery in the charger. Alternatively, if you’re in the middle of a game or something else where you can’t handle a few seconds of interruption you can just connect a micro USB cable and it’ll charge while you’re wearing them. The range of the SteelSeries Arctic Pros is seriously just bonkers. I live in a 1,400ish square foot single story ranch house and I keep my computer in the basement. I can walk around my entire house and never lose signal, which is actually super useful when you need to go AFK for a minute while you’re doing something like playing Sea of Thieves, which is a game that has a bit of downtime. While you’re taking the dog out or whatever else, you can totally hear your crewmates yell something along the lines of “Oh crap, galleon on the horizon!" and hurry back to your computer. Also, if you’re on a Skype call or something else, you can pace around or do any other thing you can do without a wire keeping you chained to your desk. The SteelSeries Arctic Pro comes with a ridiculous amount of ways you can connect them to different devices. Aside from a traditional USB plug (how I’m using them) the base station also has a normal 3.5mm line in and line out, along with an optical in and optical out. Also, they’re a Bluetooth device, so if you want to pair them with your iPhone, iPad, PS4, or whatever else, you can go right ahead. I only ever use them on my PC, but, it’s neat to have that flexibility. 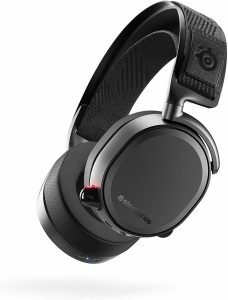 At $329.00 as of this writing, the SteelSeries Arctic Pro is in line with what “high end" wireless gaming headphones will run you. Of course there’s a lot of lower priced alternatives out there, but as mentioned, I’ve always managed to find a reason to not like the ones I’ve tried. Considering I used the last pair of headphones I had for my PC for well over five years, so while the initial purchase price is a bit high, the cost per use over time is quite low. Or maybe that’s just me rationalizing. Either way, I really like ’em and if you’re looking to upgrade your gaming headphones, these are a great set to consider.